Your support is important to the prosperity of the museum! On this page, you will be able to show your support in the form of a donation to the General Fund, a donation to the Capital Campaign for the Phase II construction of the Science Center, a donation to the Schoolhouse Restoration Fund, a donation to the Wallace McCurdy Lecture Series & Science Olympiad Awards, a donation to the Iron Hill Education Fund, or a donation to CHIPP. The Iron Hill Museum & Science Center greatly values your support and can gladly assist you with any of the following types of donations. Iron Hill Museum, 1355 Old Baltimore Pike, Newark, DE 19702. To make a General donation to the Delaware Academy of Science and Iron Hill Museum & Science Center, please enter your donation amount below. General donations will be used where the organization needs it the most. To make a donation in support of the Capital Campaign for the Phase II construction of the Science Center, please enter your donation amount below. Phase II will be an expansion of exhibit space, addition of more parking spaces, and conversion to solar power. To make a donation in support of the Schoolhouse Restoration Fund, please enter your donation amount below. The restoration includes stabilizing the exterior (replacing shingles if needed, new paint, repairs to the foundation), replacing the windows with historically accurate glass, updating the wiring of the building with an historic touch, refinishing the floor, restoring desks, etc. If you would like to donate to the Wallace McCurdy Lecture Series & Science Olympiad Awards, please select the amount of your donation below. Dr. Wallace McCurdy was a life member of the Delaware Academy of Science, Inc., and one of our longest-serving board members. He was a tireless advocate for the Museum, the Academy, and for science education in Delaware. For many years he organized the Academy’s sponsorship of various events in the Delaware Science Olympiad, paying for the winning students’ awards out of his own pocket. He also arranged the Academy’s annual lectures, held every spring and fall at the annual meetings. These, too, he paid for himself, never asking for help from the Academy. Sadly, Dr. McCurdy passed away in November of 2013. In honor of his memory and his many years of dedicated service to the Academy, the Executive Council established a fund to continue putting on the annual lectures for the benefit of the public. If you would like to donate to the Iron Hill Education Fund, please enter your donation amount below. Every year, for more than twenty years, the Iron Hill Museum gave summer camp scholarships to children in low-income earning families and a discount to schools that have been designated as Title 1 schools. Due to changes at the county level, that funding source no longer exists, but the Academy still wishes to help those families and schools have opportunities that wouldn’t happen otherwise. To make a donation in support of CHIPP, please enter your donation amount below. CHIPP is the Chestnut Hill Iron Pit Preserve. 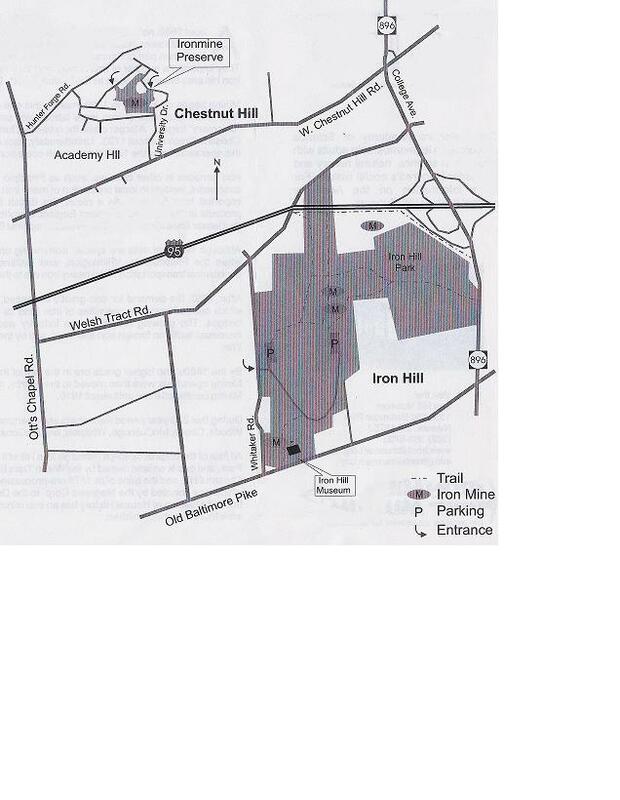 We encourage you to visit both the Preserve and the Iron Hill Museum & Science Center to learn more. The Preserve (and the Iron Hill Museum & Science Center) are owned by the Delaware Academy of Science. Would you like to visit and take a nice walk through CHIPP? Please look below at the map! It is located in Academy Hill/Chestnut Hill area. On the map it’s called “Ironmine Preserve”. Donations raised will be used for maintenance of the property.